I am beyond thrilled to have you here because it means you are ready for a change! To me, there is nothing more exciting than a woman who is tired of giving up her power to the scale and the fridge and ready to reclaim that power…and her life. 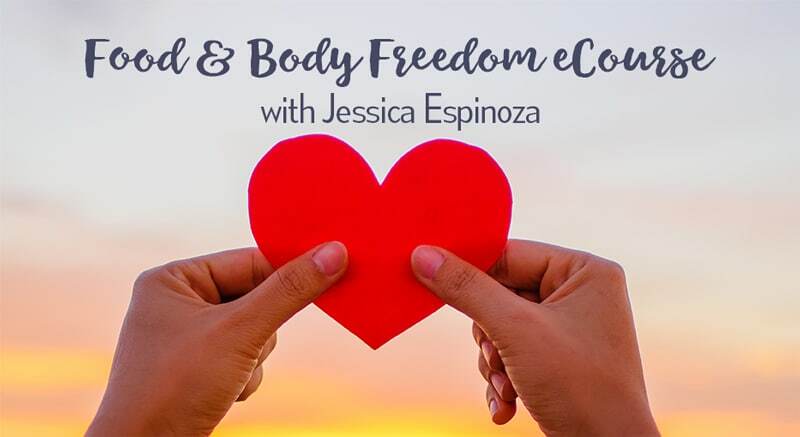 Because of my passion for helping women transform their relationships to food and body, I created a 7-day online eCourse all about finding the peace and freedom you have been searching for. Why reclaiming our power around food is critical to our long-term health, both physically and mentally. Why we must let go of the diet mentality in order to cultivate peace and freedom around food. Why you have not failed the many diets you may have tried, but why the diets have failed you! How to cultivate body wisdom and intuition (a key to healing all areas of our mind, body, and soul). How we can embrace health at every size and why weight is a poor indicator of health. How we can finally figure out which foods work for our bodies (and which do not). How to start practicing intuitive eating (a way to truly honor and respect your body and nutritional needs). How to land in a place of body neutrality, rather than the pressure of always having to love your body. During this 7-day eCourse, you will receive one email per day with information about transforming your relationship with food and body. You’ll also receive tips an Action Step so that you can begin implementing what you’ve learned that day into your own life. It is strongly encouraged that you have a journal or a Word doc on your computer or phone where you can jot down notes and thoughts as you go through this course. As soon as you sign up through the form below, you will receive a welcome email with more details. After that, you will begin receiving the eCourse over the next 7 days. I can’t wait for you to dive in, and I can’t wait to hear about how the eCourse shifts your relationship to food and body. Enroll in the Food & Body eCourse for free via the form below. If you would like extra support on your journey, I would love to have you join my private Heart-Centered Healing Around Food & Body Facebook group here. In this group, I help support women who desire to cultivate better self-care and break free from unwanted challenges around food and body. I also share information on nutrition and wellness that can help improve anyone’s health. I would love to see you there! If you are interested in working with me 1 on 1 or enrolling in one of my group programs, please fill out this form here and we can get on the phone to chat about what you most want for your health and life.